Riftwalker, a card game from many-named designers Angela Hickman Newnham and Julian Leiberan-Titus, bent my mind in a most unusual way. Usually I’m able to grok a new game fairly quickly, if only because I’ve played enough games to understand the genre norms, but Riftwalker is unique enough that I had a legitimately difficult time getting a feel for the rhythm of it. What are these rifts, and why are we walking upon (through? into?) them? I have no idea, nor do I care. Evidently this is part of a larger game universe that will soon include a storytelling adventure game called Storm Hollow. While there isn’t much of a story portrayed in Riftwalker itself, the elemental rift setting does inspire some beautiful art on the cards. It’s nice to see cards that not only look nice, but also break the standard Magic: The Gathering-style format. The game itself is very simple to learn, but deceptively deep, particularly in 2 player games. 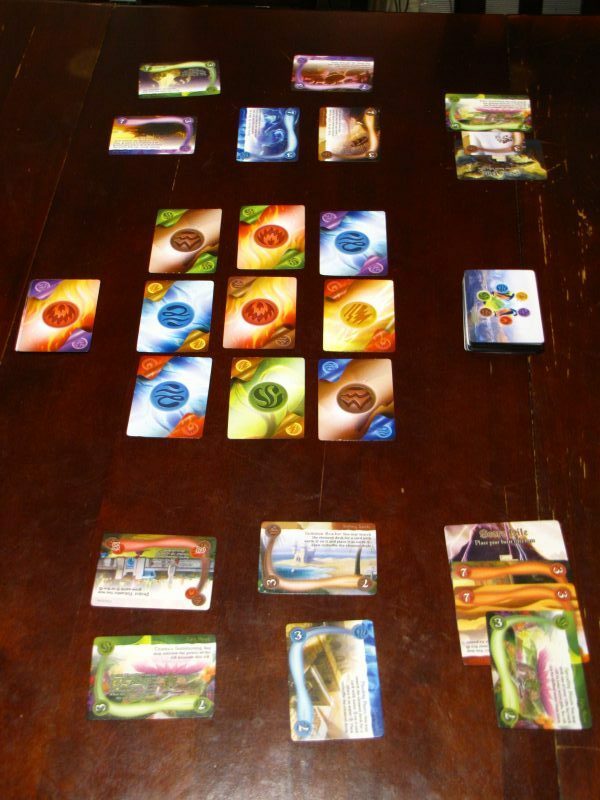 Each player starts with a hand of 3 rift cards, and a 3×3 display of element cards is placed on the center of the table. On your turn, you must activate a single element type either by flipping that element upside down from the grid (each card is double-sided, so this reveals a new element type in that spot), or by swapping out an element card with the top card from the deck of elements not in use. Following that, you can either explore a rift (by playing it on the table) or “shift” it by rotating it 90 degrees. In either situation, you can then activate the ability printed on the card. If you’re savvy, this might allow you to activate more cards or manipulate the element grid further to your advantage. Here’s the weird part: after you activate a rift card, you can then “burst” (i.e. score) one of your explored rifts, only if there are three elements in a row in the grid that match that rift’s color. I absolutely love this part of the game. I have never seen a game before that requires the players to spatially manipulate a shared resource pool, and boy is it a fun puzzle. Compounding this conundrum is the fact that rifts must be shifted either once or twice before they’re actually worth any points at all. Rift cards explored, shifted once, and shifted twice. That’s the game–simple and straightforward. But soon after beginning you will discover how layered it can get. First of all you have the card abilities themselves, which can manipulate the element grid in any number of ways, allow you to shift and/or activate other rifts, allow you to burn cards in order to boost the point value of another card, etc etc. Using these abilities effectively is a tricky puzzle, because not only do you need to think ahead of time to synergize the effects properly, but you also need to make sure that the correct element color is available to you, and you need to always be rearranging the element grid to actually be able to score your cards once you’ve shifted them. On top of that, you also need to make sure that you’re not aiding your opponent. If you have a water card ready to burst, but your opponent has two, then it doesn’t really help you to arrange three blue elements in a row. You always need to be watching at what your opponent is doing and manipulate the element grid to counter them. I cannot overstate how clever this element grid mechanism really is. Consider this: Because you need to flip over the element type to shift a rift of that color, then you’ll frequently be in situations where you play differently colored cards just to flip back the color you’re trying to score. If you take an element card from the draw pile you get to place the color you’re activating face up, which is very powerful, but you’re also unlocking the next card for your opponent, which can give them the same benefit. And sometimes the color you need is on the grid, but not in the right places, so without any cards that let you swap elements, the right play might be to swap out the color you’re trying to score in order to dig through the draw pile to get that color again to place in a better position. Game in progress. That element grid in the center is so clever! It’s nuts. Plus, because you have to activate an element every turn, and because you probably want to use a rift every turn, the state of the game is constantly in flux. But because it takes three activations before a rift is at full scoring capacity, you need to always be planning ahead. The end result is a very interesting puzzle. You’re juggling multiple long-term plans and manipulations of the element grid while reacting to new information that is popping up all the time. Sometimes it feels like an exercise in frustration, but in my experience, as soon as you hit that point, some clever play reveals itself to you, and that feels incredibly rewarding. The big downside from all of this, however, is the classic analysis paralysis predicament. Very quickly in a game of Riftwalker you’re going to want to consider a few cards in your and your opponent’s tableau, the three cards you have in hand, the state of the element grid, and the construction of the element deck. Unfortunately the print on the rift cards, while attractive, is small, and it’s difficult to see from across a table. I end up wishing I could think through the puzzle in more detail each turn, but I don’t want to take the time to do so. If there’s any game that teaches the importance of satisficing, it’s this one. This also means that the game gets worse as you add people to it. It shines as a 2 player experience where you’re constantly pushing back and forth in a passive-aggressive battle over the element grid. Even at 3 players it was alright, but lacked some of the snap of the 2 player game. But at 4 players I found it to not only be significantly longer, but also a much more muddled experience. Manipulating the element grid became an exercise in near-futility because so much will change before your next turn. 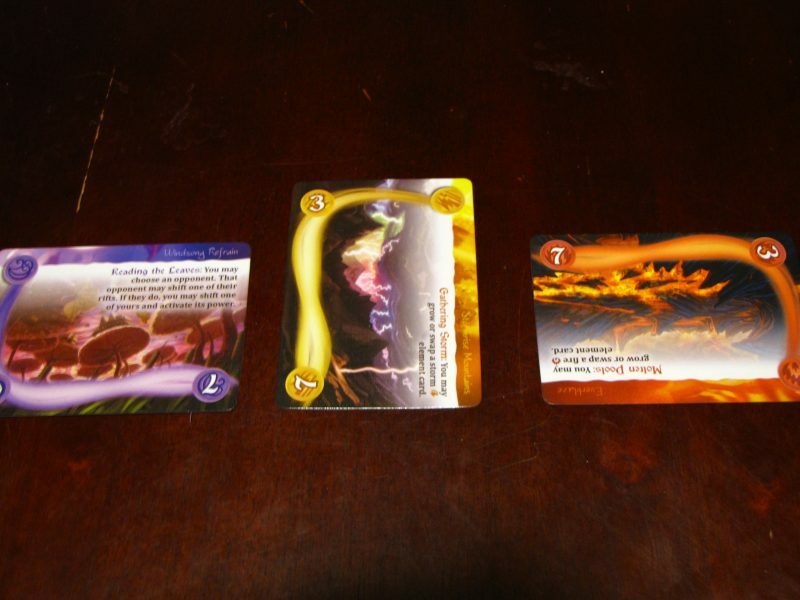 There were far too many cards on the table to account for (more per person as well because scoring is more difficult), and the rift cards that allowed a player to burst without needing three in a row on the grid were very powerful. I don’t think I’ll ever play a 4 player game of Riftwalker again. However, it will be a valuable part of my collection as a very fun portable 2 player game. Honestly, I’m not the kind of person who hunts down these kinds of small, quick games. If you have listened to my top 50 games podcast series you’ll see it full of big games with boards and pieces all over the place. But Riftwalker pleasantly surprised me. I wish the design allowed the players to understand the game state more easily, although I don’t know what the solution would be. I wish it worked better for more than 2 players. And I wish I didn’t have to feel like I’m frequently making less-informed decisions because I don’t want to slow the game down. But every time I sit down to a game I find new card synergies, new ways to think about the element grid, and my play becomes a bit tighter and a bit more streamlined. I haven’t played any game that bends my mind in this particular way and I love it. Riftwalker is joining Star Realms and Lost Cities in my collection as great, portable 2 player games. Review copy provided by designers.